A data structure is a document that describes in detail the format of the data being transferred to Integromat. Based on this document, the scenario editor is able to figure out which module returns or receives which kind of data. The data structure documents are most commonly used for serializing/parsing data formats such as JSON, XML, CSV and others. You can create a data structure by clicking the Create a new data structure button in the Data structure overview section or in the settings of the module that requires data structure specification. Supported data types are described in the Types of module items section. Data structures don't always have to be created. You can make it easier by using a template from our built-in generator. 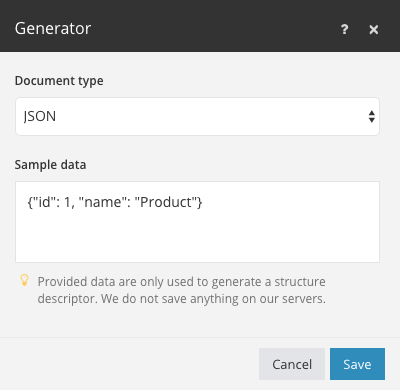 By providing a data sample, the generator will automatically create a data structure based off of the data sample you entered. The created data structure can then be manually modified.